Dolce far niente! Or what was famously coined in the book Eat, Pray, Love by Elizabeth Gilbert as "the sweetness of doing nothing" is my fave quote. When Liz went to Rome and stayed there for her food and cultural experience and learned about the love of family and friends, it felt like home and right at the moment, I wanted to be there. Follow that the same path. There is something about the Italian culture and lifestyle that's alluring. I've never been to Italy and it is one of my most dreamed of places to go. When the time comes. And when I do, this is the Italian concept that I am so going to embrace - "l'arte di non fare niente". It implies a feeling of having all the time in the world at our disposal and doing something simple, relaxing, fun, or whimsical. It's the start of the school holidays in this corner of the globe. Two weeks off school for the girls and non stop bickering at home. Don't get me wrong, I love school holidays. Everyone gets to relax and slow down a bit. Two weeks break from the morning rush, no lunch box to prepare, from homework, from other extra curricular activities. Its always a welcome break. Weekends mean lying in or a spontaneous day trip somewhere - beach, park, movies, etc. It also means a full stocked pantry and fridge - of "sometimes" foods, healthy treats and not-so healthy treats. But no one's taking stock. Whether we're at home for a staycation or out of town, we get to chill. And chill we will. 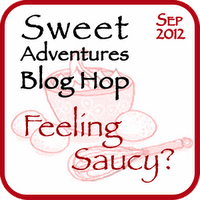 This is the first baked treat for the weekend and shall be a post for this month's Sweet Adventure's Blog Hop theme hosted by the lovely Kitchen Crusader. It's all about sweet sauces this month. And since I've almost exhausted all our fave sauces in previous posts: ruby sauce, apple compote with creme anglaise, sauce suchard, mixed berry coulis, poached pear in red wine, I thought it time to try something new. And then this came into view. I'd have to say the hero of this sweet treat is the sauce - spiced maple cream sauce. Perfect for a weekend afternoon tea shared with family. This recipe is adapted from the The Australian Women's Weekly cookbook - The Cake Stall with some tweaking. Preheat the oven to 180*C. Grease 8-cup petite loaf pan. In the bowl of your stand mixer or in a small bowl using hand-held mixer, cream the butter and sugar together until light and fluffy. Add the vanilla extract and the egg and continue to beat until combined. Beat in the sifted flour alternating with the milk in two batches. Spoon and divide the batter into the pan, top with 3-4 apple slices. Brush the tops with the melted butter then sprinkle with the sugar-cinnamon mixture. Bake in the oven for 20 minutes or until tops are golden. (While these are baking, prepare the spiced maple cream sauce and chill in the fridge). Sprinkle hot loaves with left over cinnamon-sugar mixture. Turn to cool onto a wire rack. Whisk together in a bowl, 160ml thickened cream, 2 tablespoons original all natural maple syrup, 1/4 teaspoon ground ginger and a pinch of ground cinnamon. Set aside to cool. Variation: The original recipe called for honey but I've used original natural maple syrup because we love that at home. I found that this cake was perfect served warm or fresh out of the oven and poured with some of the spice maple cream sauce. A break from our other tropical indulgences. And now that the girls are on a two week off school it's time for some dolce far niente! Join the revolution! There's some great tips here! How gorgeous is that! I'm sure super yummy, too! Thanks for sharing this...I may have to bake soon. I just love apples, and the season is on! oh and enjoy your break with the kids. Aw thank you so much for that lovely. They were and my work mates loved them. I brought them to work for morning tea.